This small, old-fashioned city with an ancient feel was founded over 450 years ago. Settled by Spaniards in 1565, St. Augustine is the oldest, permanently occupied European settlement in America. While the Spanish influence is felt throughout the Old City, it was not always under Spanish rule. St. Augustine’s strategic location made it a target for occupation by force or treaty, which happened three times before it became part of the U.S. in 1821. In the 1880s, a take-over of a different kind happened. It became a fabulous Gilded Age resort town created by Standard Oil and railroad magnate Henry Flagler. 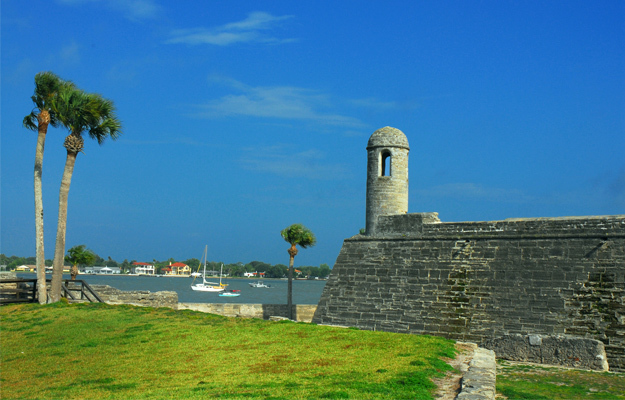 St. Augustine is a historic gem with many popular sites and museums to visit, rain or shine. Check out a little piece of St. Augustine history where the 19th century Gilded Age opulence is exhibited on three floors of the old Alcazar hotel, built by Henry Flagler. The key to understanding the luxurious collection inside is to know that super wealthy Americans during this time were collectors of the fabulous and unusual from all over the world. The Lightner Museum exhibits these beautiful and unique artifacts from personal collections. Inside an already amazing historic building, rooms, grand lobbies and loggias are filled with period pieces of opulence: furnishings, mechanical musical instruments, ornate clothing and costumes, Tiffany stained glass, Victorian art glass and sculptures. Wealthy collectors at the time traveled the globe, collecting artifacts and exotic trophies. Amid the porcelain and crystal finery, expect to also see a dinosaur egg, a shrunken head, taxidermy and numerous other odd things. There’s nothing quite like the Lightner. Wandering through it could take up a big chunk of a day, especially if you have lunch in the café in what used to be the hotel’s swimming pool. This tour covers it all: the Old Jail, Oldest Wooden School, St. George Street, Castillo de San Marco, Spanish Quarter, Lightner Museum, Pirate & Treasure Museum, Fountain of Youth, Plaza de la Constitucion, historic homes and churches, wineries, distilleries and more! 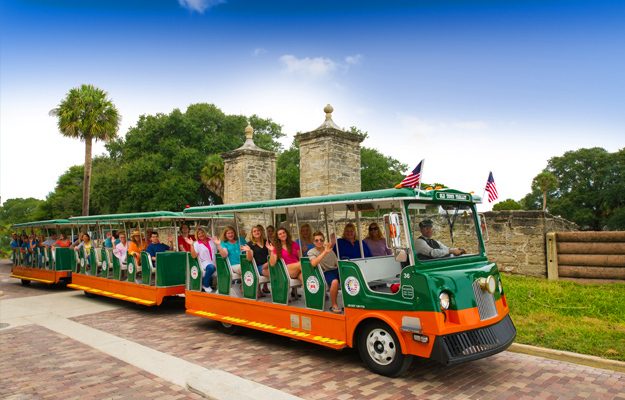 The Old Town Trolley Tour experience is comprehensive, fun and interesting, with 23 stops to hop off and back on when the next trolley comes by. This is a great way to spend a rainy day in St. Augustine. While the sides are open on the tram-like vehicles, you stay dry. Just wear one of their ponchos, not a bad idea for dashing in and out of places when you hop off. The conductors are great; making it a fun and interesting ride. You’ll have a good time learning everything about St. Augustine’s past and present. Stay on for the whole tour and decide what you want to go back to later when the sun shines. Or you can hop off at any of the stops where there’s something you want to see. Think of the trolley as your rainy day fun, friendly and informative chariot! Be sure to take a tour of the Old Jail and check out the Oldest Store at stop #1. The Oldest Store is like walking into a 1900 Sears catalog. The machines and everyday tools and home gadgets are fascinating. The St. Augustine History Museum is located here too. Also known as the historic Gonzalez-Alvarez House, this attraction not only has the distinction of being the oldest surviving Spanish Colonial building in St. Augustine, but it also represents two of the three distinct eras of the city. The first floor was constructed by the Spanish from local coquina shells in the early 1700s. The wood frame on the second floor was added by the British during their occupation of St. Augustine in Revolutionary War era. This 30-minute guided tour of the relatively small, well-preserved house explains the configuration of the original Spanish-built house and subsequent changes made to it in 1775 by its British owner. There’s a lot of history here and the guides have interesting stories to prove it. There’s a small museum inside with artifacts that offer additional glimpses into life over the past 400 years. 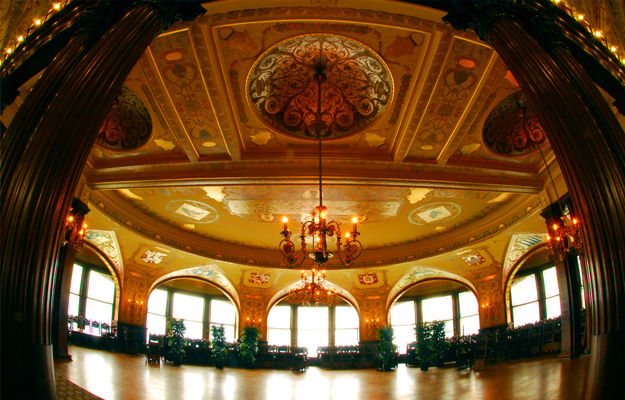 A guided tour through the magnificent halls and ballrooms of the former Hotel Ponce de Leon, now Flagler College, is a great way to gaze at the lavish, tropical resort life. It was created by visionary Henry Flagler in the late 1800s. The Spanish Renaissance architecture is opulent, and with one step inside the Grand Lobby you’ll see the details of the domed ceiling 68 feet overhead. In the massive former dining room, now used by students, you’ll find the 79 Tiffany stained glass windows, which are astoundingly beautiful, as are the hand-painted murals on the walls and ceilings. This is just the beginning of the 1800s fabulous experience. Pirates are not just the stuff of fiction.They really did roam up and down the eastern shoreline, particularly from the coast of North Carolina down through the Florida Keys. Many began as privateers in the service of their countries, only to cross over into unregulated piracy. Others were shipwrecked, stranded and abandoned sailors who banded together. Pirate lore is filled with plundering tales of the seagoing pirates with villainous names like Blackbeard, Captain Kidd and Black Bart. Famous privateer Sir Francis Drake and Robert Searles were both known to have frequented St. Augustine. The St. Augustine Pirate & Treasure Museum tells this great story through the world’s largest collection of authentic pirate artifacts and interactive exhibits. A favorite is the spine-tingling Below Deck sound experience of Blackbeard’s last battle, the world’s only pirate treasure chest, one of 2 Jolly Roger Flags and shipwreck treasures. There’s also a treasure hunt throughout the museum making for great family fun! Take a tour and sample wines at San Sebastian Winery for a relaxing afternoon treat. Or tour St. Augustine Distillery in the Historic Ice Plant to see how they mix, mash, cook and distill small batch whisky, rum, vodka and gin, all made using local ingredients. After the tour head to the tasting room for samples of these delicious spirits with the taste and flavor of Florida. Just want to hang out and have a beer on a rainy day? Check out JP Henleys where they have 70+ beers on tap and multiple TVs to watch favorite sports in action. Or, check out Milltop Tavern where you can sit under the shelter of the top deck roof and watch the world go by. Tour through the Whetstone Chocolate Factory and learn everything there is to know about chocolate from a chocolatier. Enjoy tastings of freshly made artisan chocolates and confections along the way. See if your taste buds can distinguish between cocoa nibs and dark, milk and white chocolates. Both delicious and perfect for a rainy day! Another great rainy day activity is at this unique venue where you can have a glass of wine, a bite to eat and watch a movie. It has a comfortable, friendly ambiance and good pub-type food. Screenings can be anything from current to classic, independent, foreign and documentaries. Its charming interior has two theater choices, one with traditional seating and the other with comfy club seatings and raised tables. Check it out on a rainy day to see what’s playing and at what time. A must-see for all golf buffs, the IMAX Theater, Fairways Café and gift shop make it a good rainy day outing. Located in the World Golf Village, about 8 miles north of downtown St. Augustine, the museum is filled with all-about-golf memorabilia and artifacts in permanent, special and interactive exhibits. The IMAX Theater next door entertains visitors of all ages and interests with a large selection of educational and thrilling films. Beyond the museum and theater, World Golf Village offers more restaurants, shops, golf courses and more!